How Many of You Do Locomotive Consists? I really enjoy seeing the photographs of Garry's, Chet's and others who post photos of their locomotive consists. On my layout I never intended to run consists so the reversing loop section on my layout will only hold one powered locomotive which prevents running any locomotive consists through the reversing loop. I do run a consist of Milwaukee U-Boats for my unit ore car train, but train is run only on friends' layouts. I was wondering how many of the other Forum members run consists on their layouts and please post a photo or two of the consists. I usually only run 2 locomotives at a time, but have been known to triple up heres a shot of 2 Tier4s pulling a crude oil train. At home I currently only have a small sectional shelf switching railroad that would only accommodate a single engine, but I'm working on plans for the larger railroad down the road, and trains will run with 2-3 unit consists. At the club layout I'm a part of we run 20-40 car trains with 2-4 unit consists. When you get to that size you need the extra power and a 40 car train won't run up grades very well with less than 3 really good pullers. Do F unit sets count? Here is an Athearn Genesis F7 ABBA consist going up the helix on the point of an extended Super Chief and a company executive's office car. In real life the Santa Fe would never have run an office car on the Chief or Super Chief. It would have been put on the California Limited, Grand Canyon, or Fast Mail and Express trains. Right now the only consists, other than FA/B units that came factory matched, is my Denver Zephyr, pulled by a C.B.&Q. E5A/B (basically two Proto2K E6A's with a B body on the rear unit. As I seldom run more than one train at a time, all my DCC locos are addressed at 003. I have two steam locomotives (also address as 003...for the time being), but don't run them together. I have two kitbashed 2-10-2's, remotored with the now discontinued Canon coreless motors for which I have on order Soundtraxx Tsunami TCS-2200 Steam-2 decoders. Right now, these two run pretty close together in DC. I used to run them on club modular layouts double-headed. I don't really need the pulling power of a double-header, as my freight trains are pretty well restricted to about 7 or 8 40-foot cars plus a waycar, due to space limitations. I probably could triple the length of the trains, but the locomotives would be half-way to Denver, while the waycar (caboose) was leaving Galesburg, across the 14-foot room! Then there is always my favorite consist. I didn't realize I had a photo of them. 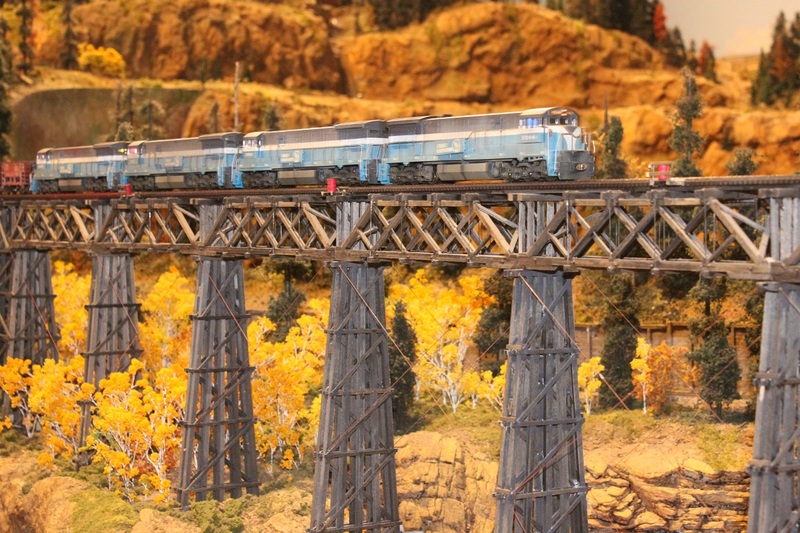 A matched set of U33Cs by Atlas painted in Great Northern's Big Sky Blue scheme. They are really smooth running units. I usually run 1, but when I do consist, I'll string 3. ...I was wondering how many of the other Forum members run consists on their layouts and please post a photo or two of the consists. I definitely do - NCE Advanced consisting makes it easy! Speed matching is what I struggle the most with. Here is something I ran at my most recent op session, a "signature" consist of the B&O during the 1960's: Three GP30's consisted elephant-style. LifeLike Proto2000 with all their axle gears replaced. Proto 2000 SD45 + 2 Athearn RTR/sound SD40's. The Proto is giving me some problems with both speed and sound volume, this was it's 2nd to last run before consigning to the workshop. At the club when I run it's always 3 together,with the coal train loaded it's 3 up front and 2 pushers.Not needed just for looks. What are you normally called then? Meant to respond a few weeks ago. I consist everything for three reasons. I like the looks, ATSF consisted everything that ran in my neck of the woods and having more than one smooths out running for me. Here's a pair of GP60M's with a GP60B thrown in for good measure. All are Athearn powered units. I have some pretty serious grades on my layout, so I have dabbled in Consisting. Like IronBeltKen, I struggle with speed matching. I had three GP38-2's consisted once and they ran pretty good, but when you're dealing with a nearly 3% grade and only one of the three decoders supports BEMF, you get a bit of fighting going on. I had a video of my Atlas Dash-8bw consisted with a Rivarossi U25c. Can't seem to find it now, but those two together could pull anything on my layout. Then I upgraded the decoder in the U-Boat and haven't bothered speed matching them again. I rarely run less than two engines on a train. I have yet to consist two or more locomotives, and I have been in DCC since 2005. I know you can run two DC locomotives together without really consisting them digitally, as many have done for decades. However, consisting them digitally is something in the future....mebbe. I did try a dual throttle consist with two different locomotives, a PCM Y6b 2-8-8-2 and a BLI BlueLine with a QSI Titan aboard. In fact, both locos now have Titans because the original LokSound in the PCM died four years ago. I use Digitrax DT400 throttles with their dual encoder knobs, meaning I can manipulate two locomotives' driving, lighting, and sounds concurrently with each encoder knob controlling one of the two engines. It takes some doing, much like the prototype, because their drives are different and their driver diameters are different. I had to keep fiddling to get them to work well without the BEMF cutting in and making one buck and surge against the other. I managed to make a run around my entire 60' of folded main without stringlining or derailing or making one drag the other. Yeah, I've only made it as far as to consist a pair of F units, here's my favorite pair...…. This is one of the consisted locomotive trains I ran in the earlier days of my railroad. I'll get ambitious from time to time and put together trains like this. When I consist, I do it at the time I'm going to run the train. I have way to many locomotives to dedicate specific locos to a permanent consist.